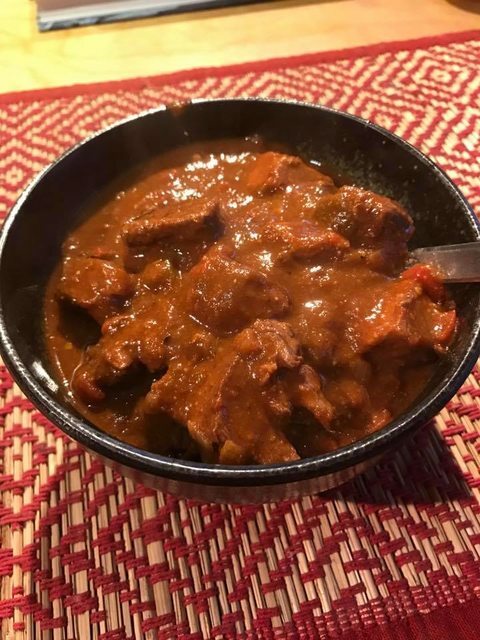 I had a hankering for real, Texas-style chili: no beans, stew beef rather than ground beef, and a slew of different chiles, both dried and fresh. Your mix of peppers determines the heat; I opted for milder spiciness, if you like things hotter, add in some dried Thai bird chiles or some fresh scotch bonnet or habaneros. split and seed the dried chiles, toast them on a hot, ungreased cast iron skillet, one at a time, pressing them down, flipping and pressing them down again, 10 seconds or so per pepper. Transfer to a bowl, cover with boiling water and soak for 30 minutes or so. Transfer the peppers to a blender, add half the garlic, the cumin, the reserved adobo, a bit of salt, and enough of the soaking liquid so you can puree the peppers. Work the puree through a medium mesh strainer back into a bowl. Heat 2 tbsp oil in a skillet and add the pepper puree, cook, stirring over high-heat for 2-3 minutes, until it darkens slightly and becomes a bit glossy. Transfer back to a bowl. In a six quart dutch oven or pot, heat another 2 tbsp of oil. brown the beef in batches. remove to a bowl. Once all the beef is browned, without wiping out the pot, add the onion and saute until translucent. Add the green chilis and the remaining garlic, cook, stirring until the pepper softens slightly. Add back in the beef, toss to coat, then add the chili sauce, tomato, and oregano, stir, bring to a boil, then reduce heat and simmer, covered, until the beef is tender, 2-3 hours. Right before serving, stir in the masa (which will thicken the sauce slightly) taste, adjust salt, if necessary, and serve with corn bread. In main course, Savory. Bookmark the permalink.